Nursing your baby just became more hygienic and convenient! LuvLap introduces a range of ergonomically designed and easy-to-use nursing essentials, which help new mothers to conveniently breastfeed and sterilise feeding bottles with ease. Give your baby the best nourishment possible with breastmilk! 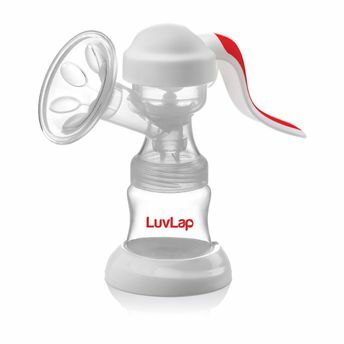 LuvLap New Manual Breast Pump makes it easy to derive breast milk and store it for further use. It has soft silicon cushions that help in expressing milk comfortably without hurting the breasts. The ergonomic shape gives better grip and easy pumping with one hand. The intuitive design of this breast pump helps in easy assembly and cleaning. Compact and travel-friendly this breast pump comes with an extra container for pumping and milk storage. Teat and cap included. Ergonomic shape: For better grip and easy pumping with one hand. About the Brand: Luvlap aims at bringing the best of Baby care, Hygiene and Travel gear products that are made keeping in mind the demands and needs of Parents and their new born baby .Made with care and using the latest technology, all LuvLap products undergo multiple quality checks before they are despatched to the stores and conform to the European standards of child's safety.